According to the report, it costs only a slight premium to place Facebook ads on iOS devices— $4.99 per thousand impressions (CPM) versus $4.87 for Android. Average cost per click (CPC), or the amount an advertiser pays when a user clicks on one of those ad impressions, is wildly more disparate, however. Advertisers pay $0.18 per click on Android against $0.40 per click on iOS. Despite the low CPM and CPC numbers, advertising on Android actually yields negative ROI— it costs advertisers more money to place the ads than they make, to the tune of a 10 percent loss, according to the report. 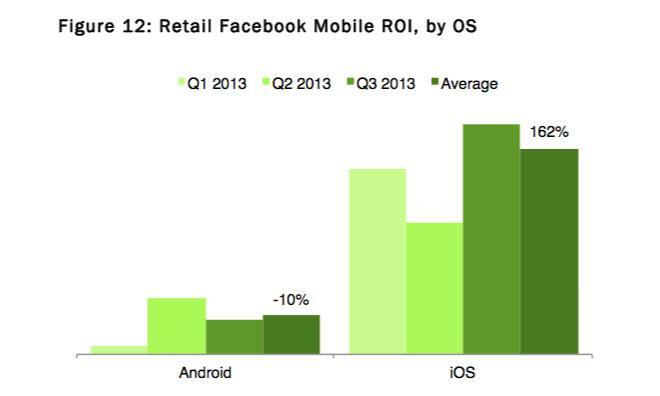 iOS advertisements, meanwhile, bring healthy returns of more than 160 percent.